From Hattiesburg on US49 South, exit at Camp Shelby South Gate (You must enter the base through this gate). From the Southgate entrance follow Lee Ave West to the railroad tracks and turn right then go past the Camp Shelby Credit Union to the first stop sign. Turn Left onto Forrest Ave and follow it past the Mississippi Armed Forces Museum and around to the right past the parade ground. You’ll pass the Fitness Center on the right and a few streets further is 16th Street. Turn left onto 16th and go to Ave C. Turn right onto Ave C. Go past the all ranks club on the right, and then look for the campground sign on the left at 26thstreet. Turn left into the campground. ---- Call ahead to see if there is space available; if there is you can proceed directly to the campground from the Southgate entrance. You can check in and pay with the camp host or at the Fitness Center located on Forrest and 14th streets. ---- Strongly recommend calling ahead first AND reviewing the Google Map of the base first. We were evacuated by Hurricane Michael from our Florida campground and thought we would try the Hattiesburg area due to a "safe" weather report. We didn't have a reservation but the campground host, Tammy, was very friendly and accommodating. There were several large shaded sites to choose from for $15/night full hook-ups. The restroom was extremely clean with 2 free washers/dryers in each. The campground was mostly full-timers but their sites were very well kept and the they were friendly. The armed forces museum was very impressive. We enjoy bicycling riding and the Longleaf Trace (41 miles paved rail-to-trail in Hattiesburg) was only about 25 minutes away. We look forward to returning when we are in that area. I motorcycle tent camp. Called and was told this FamCamp does not allow tent camping. Ridiculous policy, but given the Fire Ant reviews perhaps not so ridiculous. Lake Walker is a true diamond in the rough if you are looking for a quite, scenic, and relaxing time. We stayed in a site that overlooked the lake; a million dollar view. 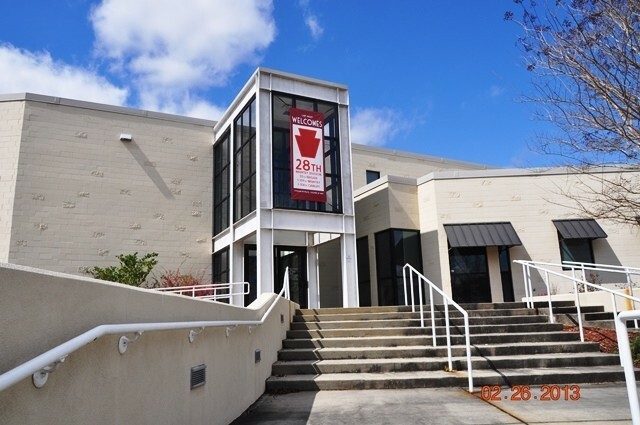 It is located in rural Mississippi, so recommend that you arrive with items that you will need for your stay. Sites are spacious, bath house was dated but clean, free laundry, and the host was extremely friendly. We used Crane Wi-Fi antenna and had no problem getting MWR Wi-Fi. Previous reviews mentioned homesteaders and that has not changed, but several sites were vacant and one site is dedicated to overnight stays only. Rates have increased to 15 dollars a night. No cable, but we could pick up many channels with the RV antenna. All ranks club is located a short distance from the CG and is excellent-one of the nicest we have been to. Overall, great experience, good value and highly recommended. In the past this campground has received bad reviews. Perceptions of homesteading here were prevalent but I think many of the sites were occupied by activated troops here for training. IMHO, active duty/active guard troops that came here for the mission should have had priority, and although there may still be a few longer-term campers here, now that the base's mission has subsided, many of the spots are open for use. 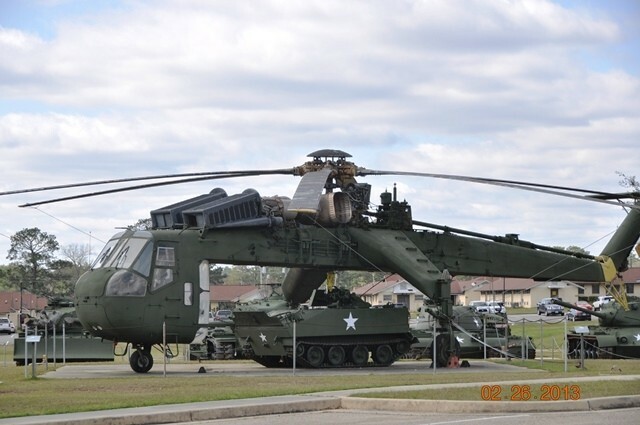 The base has a fantastic military museum that should not be missed if here. There is also a very nice all ranks club located not far from the campground that has decent food and reasonable prices. The lake offers fishing and boat rentals, but there is no swim beach and swimming is prohibited. Bring some fire ant treatment (I used the cheap (under $4/bag) Spectracide granules that worked fine) but they weren't that bad while I was here. People are friendly and the campground remains a great value. First the positives: 1. Open spots. Not "100% Homesteaded" as previous reviews stated. 2. Excellent camp hosts. 3. Beautiful location. 4. Cheap. $90 per week. 5. Excellent Armed Forces Museum on base. Now for the bad: FIRE ANTS This was my first and hopefully last experience with fire ants. Our site was infested with the pests who soon invaded our RV and began biting my family and me. If you haven't experienced fire ant bites, I hope you never do, if you have, you know how painful the bites are. After talking to the camp hosts, we learned that the base doesn't perform regular pest control at the campground. If you decide to go, thoroughly inspect the grounds of your site. Bring lots of ant poison for inside and outside your RV, and spray everything that touches the ground. 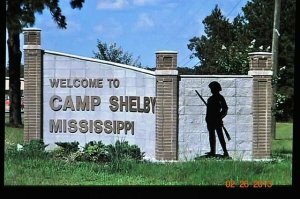 Just visited Camp Shelby Fam Camp. There is little I can say that hasn't already been said in the previous comments. If you 'do the math' you will find the Fam Camp is bringing in over $88,000 dollars a year for 37 sites. Minus the cost of mowing, and electricty. We found the Fam Camp sitting on a beautiful pond like setting. Military Fam Camp, on one shore and on the other several beautiful cabins. I will have so much more to add to this review. The Fam Camp is under very poor management. We talked with Perry S Conerly, he acknowledge himself as the person who accepts reservations for the Fam Camp. Like others we asked if there was anything available. He said no, I inquired when will there be something available. He looked to the side of the room as if looking at a site management board. He told us he didn't know when there would be anything. I asked for his name and phone to call back for a reservation. I doubt that it will do any good to call; but I intend to call and continue to call until I'm told that something is available. We didn't tell the gentleman that we had aready drove through the camp and saw the overall conditions. I ask Conerly why the camp was so full, he stated there was little available housing on post. Wrong!!!! With all the barracks on post there is more than enough room and I reseached the area and there are 10 commerical and state park campgrounds within 30 miles of the post. More than enough space for those persons who desire to maintain a more permant living situation. They are called 'homesteaders', the military is aware of the regulation reguarding 'homesteaders' they wrote them! We saw no Class A units on site. All of the units on site were trailers and 5th wheel trailers. Why move, what is the saying? Why buy the cow, when you can get the milk for free. You name it and it was sitting outside, everything from patio furiture to freezers and such. The management should be ashamed of themselves for allowing this Fam Camp to get in this condition. With the money made from Fam Camp each year build another Fam Camp for the retirees who want to travel through. Until we all step up and express our views to those that count nothing will get changed. I plan on making a formal complaint to the persons in charge of Outdoor Recreation and higher. This could be a beautiful Fam Camp if properly managed. Take my lead and help reform this Fam Camp and others we might find. It only takes a phone call to find out who is in charge. Make the letter's or emails positive. Point out your observation and ask they be addressed. The contact number for the Fam Camp is (601) 558-2397 Perry S Conerly, manager. Ask for his supervisor, get that phone number and address and pass it on. Then ask for the persons name over that supervisor. Then starting writing letters. With your help, emails & letters we can make a difference. 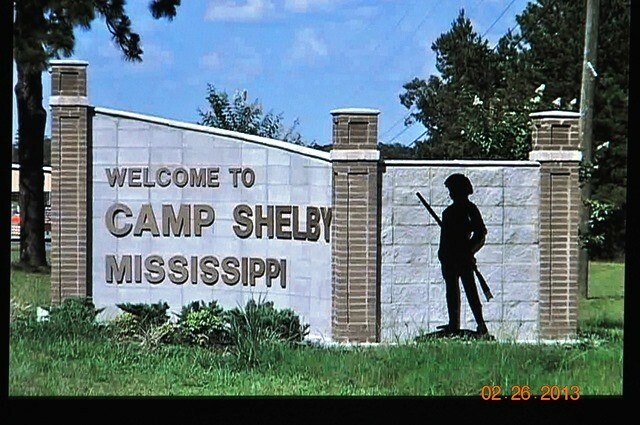 Camp Shelby has so much to offer, lets get busy and take that first step toward making Lake Walker Family Campground, Fam Camp a new destination. This place is still a squatter's trailer park. My wife just arrived from deployment from Afghanistan after a year. My daughter and I wanted to visit her for a few days because she is stuck there for another month. So she personally went to the gym to find out about the "famcamp" and was told that there were no sites available because they were all being used by long term retirees INDEFINITELY! So as others here have said, go to the Paul Johnson State Park a few miles south of the base. If this FamCamp is part of the MWR program, they will be hearing about it. 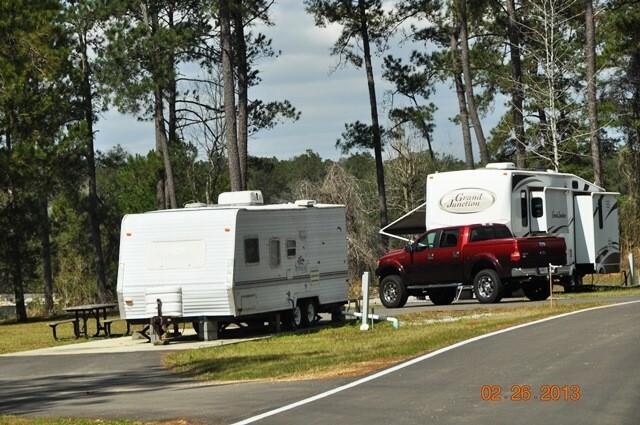 If this campground is not available to everyone, then it should be removed from the military campgrounds.us web site. Sees to me that the Good 'Ol Boy network is working well at this location. First of all - we did not stay here. We called but "no room at the inn", same as many of the reviews below. So we stayed about five miles south at Paul Johnson State Park which was WONDERFUL. We had full hookups, 50 amp, water, sewer, paved sites, right on the lake, a premium site for $24/night. A non-premium site not backing up to the lake but just 30 feet farther,was $20/night or $14 with a senior discount. This was our first stay at a Mississippi park so we didn't know the rate structure. The next day we tried to find the RV park on base but no one there knew where it was. Considering that the base itself is off the beaten track, I don't know why anyone would want to stay there. The exchange is very small. We did utilize the free laundry which is available to all military personnel on the base. It was kind of dirty but the washers and dryers worked great and the cost ($0) was excellent. 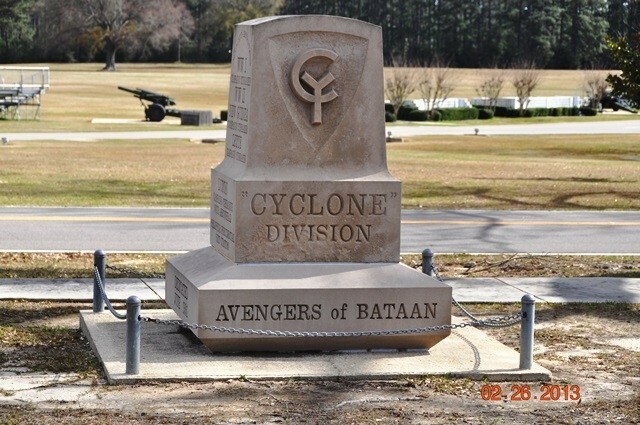 We visited the Armed Forces Museum on Camp Shelby and were very impressed. It looked like a small building but seemed much larger once we started through. The exhibits were excellent and very extensive. We were there over three hours and could go back. Great job by the people that put this together. We loved the state park and in the past two weeks have stayed at three more MS state parks. 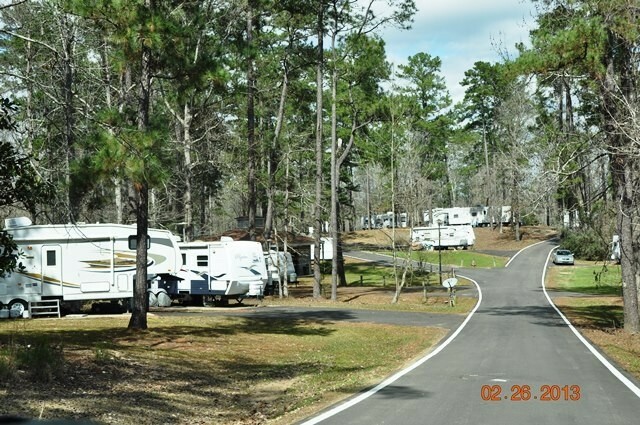 We have visited 35 states and feel these MS state parks are one of the best bargains in the country for RVers. I have been at this Campground for quite some time and would like to explain some of the comments on this page. The post is a mobilization center and has been active since 2004. The majority of the campers here are mobilized reservists/National Guardsmen that conduct the training for soldiers going overseas. There are a few retired homesteaders who are taking advantage of the bargain rate (200.00 per month). The most recent good news is availability. The post has recently added 7 new sites and at the same time, the optempo is slowing some. Between these two events, availability has gotten better. I encourage anyone staying in this area, to look into this campground. Don't assume there are no spots available, call and see (601-558-2397). The campground is on a beautiful lake and the post has upgraded the PX, Clothing Sales and is in the process of expanding the Gymnasium. I hope this review helps anyone that might be passing through this area. Happy camping. The price is great if you can get a site. We were fortunate the week we stay, there were 2 sites available when we arrived, then full for 5 days. The biggest problem is the "homesteaders". The camp host and one other person I talked to have been there 5 years at $200 per month with free laundry. What a bargain for them. One could tell others have been there for quite awhile by the fenced "yards" and other stuff around their RV sites. Park regulations are not enforced. For example, the person next to us had a pitbull and two other smaller dogs that were left outside unattended all day long while they went off to work. Needless to say, they barked all day and the camp host told us there was nothing he could do. The manager at the gym was aware also but said he could do nothing although the camp regulations state "no pets will be left unattended". The base commander needs to look at who and how his campground is being used and abused by a few. I was fortunate enough to get a space for 1 night on May 21, 2009. Judging from the remarks of previous reviews it would appear that none of the respondents had any kind of conversation with any of the people responsible for the campground..I talked with the supervisor who runs the Gym and recreation facilities and found that the people who are staying in the campground are for the most part full time military people who are operating the program of training (cadre) for recalled National Guard and Reservists before they are sent to Southwest Asia. Same old crap every time I visit there. Sites are still full of homesteaders with all their permanent stuff like buildings and big freezers. Please take this place off the Famcamp list. It is a very nice trailer park though. It is a travesty as a so called Famcamp. The post Commander should be ashamed. Like other people I have spoken with reference this facility I was told that there are no reservations or sites available anytime. I was told by Jim that the camp ground has been taken over by the base to house individuals coming in for training and is no longer considered a FAMCAMP for anyone not coming down for training. If this is the case it should be taken out of all the campground books listing military FAMCAMPs. If this is not the case, the Post Commander needs to get involved in this matter and have it run in accordance with its MOU charter as pertains to military FAMCAMPS on active military posts. Once again I visited the post. Please do everyone a favor and take the word campground out of the sign. You are false advertising a product. It should be called Lake Walker trailer park. This is the worst run trailer park I have ever seen. People should be ashamed of themselves for never leaving and sponging off the government. It's beyond words. I get sick thinking about those full timers who ruin it for everyone else. It is pretty evident the camp host nor the post does not care. I have been told several people sold their houses and just moved in there. I know why there are no reviews of this campground. No one can get in there because it is full of full timers. 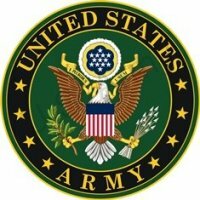 I tried for a couple months prior to going to Camp Shelby. There must not be a maximum stay limit, because no one ever leaves. Some have even gone so far as to build fences around their campers. I guess a better name for it would be a mobile home park. Good luck if you want to stay. Maybe someone can have better luck than myself and several others I have talked to. Guess you have to know someone way up the chain. It's a great place to drive through and see homesteaders enjoying their park. 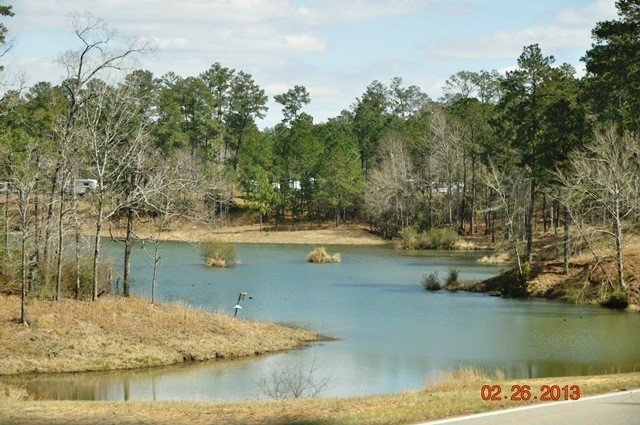 If you do want to stay in the area, I highly recommend Paul B. Johnson State Park just down the road from Camp Shelby's south gate. It is a great place with a very nice lake.